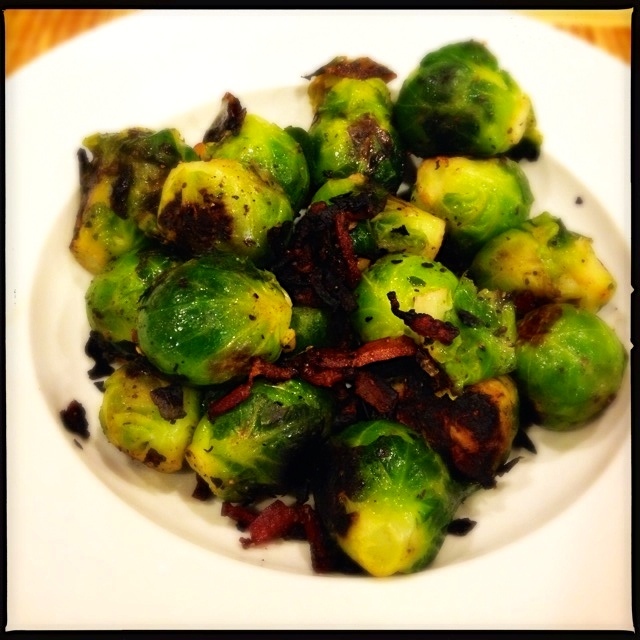 I was never much of a brussels sprout fan, until I tried this recipe. Smoky, charred, and redolent with bacon and a touch of lemon, these brussels sprouts are really out of this world. And maybe the best part is that they are super easy to make. Just chop frozen brussels sprouts in half, sauté them in bacon and oil, and top them with salt and pepper and a squeeze of fresh lemon. These can be dressed up with lemon zest, or hot red pepper flakes, or even a splash of Cinzano Blanco (white vermouth) added with the lemon juice. (If you want them even spicier, add the hot red pepper flakes to the pan when the oil is added to the pan. If the Cinzano Blanco has too much alcohol for you, you can add it half way through charring the brussels sprouts. It will cook off nicely and still flavor the dish.). Ok. You and I can both see that these aren’t cut in half. I was being lazy the last time I made these. And they weren’t nearly as good as if I had cut them in half. I was never much of a brussels sprouts fan, until I tried this recipe. This is an absolutely delicious side dish for any chicken or fish dish. It takes about 15-20 minutes to make. These can be dressed up with lemon zest, or hot red pepper flakes, or even a splash (1 to 2 T) of Cinzano Bianco (white vermouth). Cut the brussels sprouts in half at the middle, so they become half moons. Heat up a heavy pan over medium-high heat. I like to use a well-seasoned cast iron pan. Add the cut brussels sprouts to the hot bacony oil, cut side down if you can. Let the brussels sprouts char for a few minutes. You do want them to get black, so that is perfectly ok here. Once the cut side is charred, I like to shake the pan or stir it with a spatula to char the rest of their outsides a bit. Once the brussels sprouts are nicely charred, remove them from the pan and season with salt and pepper to taste. Squeeze ¼ of a lemon over the brussels sprouts. Everyone will devour these, so make extra next time!